April 15th falls on a Sunday, and Washington DC celebrates Emancipation Day (the day Lincoln freed the slaves) on Monday, April 16th so Tax Day is Tuesday, April 17, 2018. In 2017, you were required to have insurance all year unless you qualified for an exemption. You might have gotten your insurance from an employer, from public insurance (Medicaid, Medicare, VA coverage), or from private insurance (purchased separately or from the Marketplace). And now your 2017 taxes are due. Don't get confused, get organized! 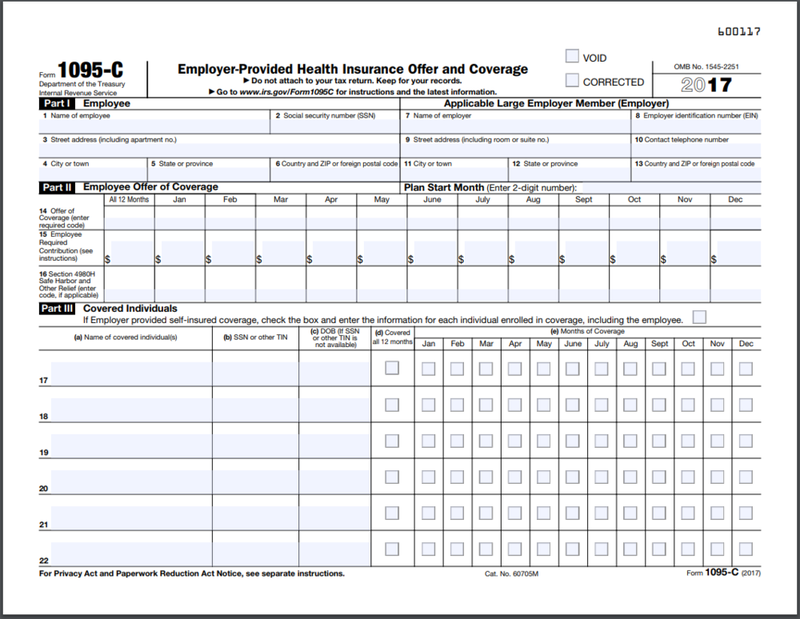 If you got insurance from an employer or public insurance, you should have gotten 1095-B or 1095-C forms from them. You can file your taxes without those forms, though, because they are also reporting to the IRS. If you got insurance through the Marketplace, you need the 1095-A form. You can find that online in your healthcare.gov account. With the information you have on the 1095-A form, you can reconcile your tax credits, which you do using IRS Form 8962. Find out more about how to reconcile tax credits with this handy explanation. If you got private insurance without tax credits, your insurer should have your 1095-A, and you don't file for tax credits. You still have to submit the 1095-A as proof you had insurance. I Didn't Have Insurance. Can I Get An Exemption? you were living out of the country for all or part of the year. There are other exemptions, too. You file for an exemption using IRS Form 8965. Find out more below. No Exemption? No Insurance? Pay a penalty. If you don't qualify for an exemption, and you didn't have insurance, you might need to pay a penalty. For the 2017 plan year, the fee is calculated 2 different ways — as a percentage of your yearly household income, and per person. You’ll pay whichever is higher. 1. Percentage of income: 2.5% of yearly household income. The maximum is the total yearly premium for the national average price of a Bronze plan sold through the Marketplace. 2. Per person per year: $695 per adult or $347.50 per child under 18. The maximum is $2,085 per household. NOTE: Think about each person in the household separately! In some cases, you may have one person on the Marketplace or with employer insurance, one person with an exemption based on affordability, and a child on Medicaid or MIChild. If you finish your taxes, you realize you will owe some money, and you don't want that to happen again, come visit us at 555 Towner, Ypsilanti, MI M-F 9-4 p.m., or call us at 734-544-3030, for a free consultation. 1095-A, 1095-B and 1095-C: What are they and what do I do with them? En Espanol- 1095-A, 1095-B and 1095-C: ¿Qué son y qué debo hacer con ellos? You may have recently received a form in the mail from DHHS, your employer or the Marketplace. The 1095 form is your "proof of health care coverage" for 2017. Remember if you did not have health care coverage for more than 3 months, you are required to pay a shared responsibility payment (penalty). You will need this form when you go to file your taxes. There are 3 types of 1095 forms--for Marketplace insurance, public insurance, and employer insurance. If your status changed during the year, or if you had multiple employers, you may get more than one type of 1095! If you had health care coverage through the Marketplace for any part of 2017, you will receive a 1095-A. If you selected electronic communications, you will receive an email notifying you that your 1095-A can be downloaded from your Marketplace account at healthcare.gov. Your marketplace statement will indicate your tax credit and this form is used to determine whether you may have to pay part of your tax credit back or whether you will receive more of a tax credit. You will receive a 1095-B form if your health care was provided by your employer or was provided by the government through the Children's Health Insurance Program (CHIP, MIChild in Michigan), Medicaid, Medicare or a basic health plan. These forms may not be mailed until after March 2. The IRS states it is not necessary to file a 1095-B with your taxes. Employees will receive a 1095-C if you health care was sponsored by your employer. Want more details? The IRS has detailed information about the 1095 forms here. Some of you--of a certain age--may remember the Sy Syms commercial, with the tagline, "An Educated Consumer is Our Best Customer." Well, what's true for buying clothes is even more true (100 times more important, probably!) for choosing health insurance. So here are a few things to know, if you are shopping for health insurance. 2. If you had a plan last year, don't let it auto-renew. Spend the hour it requires to assess everything again. Provide revised income estimates, check your dependents, update your address. Most importantly, the plans have changed. In some cases, they have changed A LOT. Make sure you are aware of which doctors or health systems are in-network or out of network for any plan that you choose. These networks can also change between plan years. Because costs are calibrated for tax credits based on the second-lowest cost silver plan, when the costs for that plan change (and this year they changed a lot! ), the tax credits change a lot too. But if you were eligible for subsidies before, and your income is similar, you will pay the same or less--but you may need or want to change plans. 4. If your income is between 200% and 400% of the poverty level ($24,120-$48,240 for a single person, $49,200-$98,400 for a family of 4), it is highly likely that you will find the gold and bronze plans more appealing. Gold plans, on average, will cover 80% of your medical costs and Bronze plans, on average, will cover 60% of your medical costs. Explainer: The Trump administration made some last-minute changes removing cost-sharing subsidies, which are only applied to silver plans. Because of this, the cost of silver plans went up more than the cost of gold or bronze plans. But because tax credits are calculated based on silver plans, your tax credit will likely go further on the bronze or gold plans. If you want the details, read this. 5. If your income is over 400% of the poverty level ($48,240 for a single person, $98,400 for a family of 4), you will not qualify for tax credits. But you might find better deals off of the Marketplace. Work with an in-person or online insurance broker, and make sure you are choosing from ACA-compliant plans. These should be marked as Bronze, Silver, Gold or Platinum. If they are ACA-compliant, they will have the same essential benefits, but the cost may be less expensive. Washtenaw Health Plan staff will answer your questions and help you figure it out. It's complicated. Different people in a family may get different coverage. Parents may qualify for the Marketplace, kids may qualify for Medicaid or MIChild. An older couple might have Medicare, Medicaid and/or Marketplace. No situation is too complex, no question should go unanswered. We'll help sort it out. Call 734-544-3030 or walk-in to 555 Towner St. Ypsilanti from 9 am to 4 pm Monday through Friday. What Are Cost Sharing Reductions And Why Do They Matter? If CSR payments were not paid, insurers would still be required to reduce cost sharing, but they would now have to do it without the government’s help. They would have to raise premiums dramatically to make up the lost revenue. The irony is that if plans do raise premiums, the federal government would be on the hook for much of those costs. The government absorbs premium increases through the tax credits that help people afford coverage. The law is designed to keep premiums manageable for people, so it falls on the government to cover any excess increases. There are two parts to the subsidies that people who get health insurance through the exchanges may receive. Part 1--which most people are familiar with--is called the Advance Premium Tax Credits (APTCs). They assist people who are up to 400% of the poverty level ($98,400 for a family of 4), to help afford monthly premiums. Part 2--which most people are not familiar with--are Cost-Sharing Reductions (CSRs). These support families whose income is between 138% of the poverty level (Medicaid cut-off) and 250% of the poverty level ($61,500 for a family of 4), by reducing what they would pay for co-pays, co-insurance, and deductibles. For households that qualify, cost-sharing applies to silver plans (only), and transforms them into something better--often much, much better. The truth is, if not for the CSRs, low-income families might be able to afford the premiums, but visits to the doctor could be cost-prohibitive, and high deductibles and maximum out-of-pocket costs would mean that getting sick could still turn a family's life upside down. More than half of the people in the U.S. who got health care on an exchange got cost-sharing reductions (7 million out of 12 million)! Actuarial value is an estimate of the percentage of costs that--on average--a plan will cover. (For any one family, this might be a bit higher or lower.) Under the ACA, a household with income below 150% of the poverty level can get a silver plan that covers 94% of their costs; a household with income between 151%-200% of the poverty level can get a silver plan that covers 87% of their costs; and a household with income between 201%-250% can get a silver plan that covers 73% of their costs. Have a question? Type it in the comments section and we will get back to you. The Proposed American Health Care Act: What Would Replacing the Affordable Care Act Mean? The American Health Care Act (AHCA) was introduced to Congress by Republican leadership on March 6, 2017. The AHCA is a proposal that would replace the Patient Protection and Affordable Care Act (ACA, sometimes called Obamacare). The changes would reduce coverage options and make coverage unaffordable for many of the 20 million people who recently got covered under the Affordable Care Act. The Washtenaw County Board of Commissioners does not support any weakening of the ACA. Read the Resolution Opposing the Repeal of the Affordable Care Act and Supporting Additional Efforts to Strengthen Healthcare Access for All for in Washtenaw County. Older Americans could be charged up to 5 times more than someone younger. The ACA currently allows a 3 to 1 ratio. So if currently, the premium for a 20-year old is $200/month, the premium for a 64-year old could not be more than $600/month. Under the proposed law, a 64-year old could pay $1000/month. States would need to pay much, much more for Medicaid. Currently, 31 states have expanded Medicaid. The AHCA ends federal funding for new Medicaid enrollees post -2019. This means that states would foot the entire bill for new Medicaid recipients, which would be unaffordable to states and would force the Medicaid expansion to be severely curtailed or ended. Lower-income Americans would bear the brunt of the burden. People currently receiving ACA coverage, particularly those with low incomes, receive tax credits and cost sharing (lower deductibles and lower maximum out-of-pocket expenses) based on their income. There would be no cost-sharing, which is a part of the ACA that benefits individuals under 250% of the poverty level (suggest an amount?). The AHCA replaces income-based tax credits and cost sharing with a universal tax credit. As can be seen in the map below, this benefits younger individuals and people with higher incomes. Essential benefits would no longer be "essential" for people on Medicaid. Currently, there are ten essential health benefits, including treatment for substance use disorders, mental health, contraception. Under the proposed law, they would not be essential for people on Medicaid. Contraception for low-income women is threatened. In addition to not requiring the same essential health benefits for people on Medicaid (thus making contraception "optional" for coverage), the proposed law bars Planned Parenthood from receiving reimbursements for services through Medicaid, even though federal law already bans the use of federal funds for abortions. Planned Parenthood is a major provider of contraception (and cancer screenings and prenatal care) for women across the country, particularly low-income women, whether on Medicaid or uninsured. Under the ACA, geography plays a role in determining tax credits and premiums. Under the proposed legislation, geography is not relevant. Thus, in high-cost states like Alaska, more people will be adversely affected. Read more Seven Groups That Could Complicate GOP Plans To Repeal Obamacare By Perry Bacon, Jr. March 7, 2017. The New York Times map below shows how tax credits change for different age groups. As your income goes up, you benefit across the board, but in general, older Americans will pay much much more. Read more: Who Wins and Who Loses Under Republicans’ Health Care Plan By Kevin Quealy and Margot Sanger-Katz, March 8, 2017. Use the tools below to compare proposed plans and premiums based on age, income, community, gender and more. The Kaiser Family Foundation has a comparison tool that allows comparison of the ACA to the AHCA and other replacement proposals. Comparisons can be made across various areas: Women's Health, Individual Mandate, Medicaid, Medicare, Cost-Sharing and more. Use the KFF Comparison tool located here. This map allows you to compare premium assistance across age, income, and location for the ACA and the AHCA in 2020. The AHCA does not adjust premium assistance based on income or geographic location. Under the AHCA, a 40-year-old who makes $20,000 receives the same $3000 premium assistance as a 40-year-old making $75,000. Depending on where you live, this could pay your whole insurance premium or only a portion of it. Click here to compare your costs now with what they would be under the AHCA. Why the urgency to replace the Affordable Care Act? Republicans claim that premium increases are driving this choice. But how many people are actually affected by premium increases? This interactive infographic explains that only 3% of people are affected by rising premiums. It’s Fewer Than You Think) By Troy Griggs, Karen Yourish, and Margot Sanger-Katz. March 9, 2017. It's that time of year where Top 10 lists abound. On the theory that you might be interested in the same topics that interest other people, here are the posts that were visited the most in 2016. #2 HOW TO FIND A DHHS CASEWORKER'S EMAIL ADDRESS AND PHONE NUMBER? #3 How Do I Report Self-Employment Income? ¡Necesito Ayuda! Trabajo por mi propia cuenta, ¿cómo reporto ingresos para Medicaid o el Mercado de Salud? #9 1095A, 1095B, 1095C: What Is It and What Do I Do With It? #10 Understanding A Medicaid Deductible, Or "Spenddown"
Imagine that you and a friend want to go to the Bruce Springsteen concert. Your friend says, "I'll get the tickets. I think they are selling for between $80 and $120." You say, "How about if I give you $100, and then when you actually find out the cost, we can settle up." Fast forward to the next week, and your friend tells you they cost $120. You pay the additional $20. In a lot of ways, this is just like the Affordable Care Act's Advance Premium Tax Credits. In advance, you make a good faith estimate of the cost--and at the end of the year, you pay more if your income was higher; and less if your income was lower. Angela did not work as much as she thought and her W-2 at the end of the year is $17,500. Angela picks up a second job and makes an extra $3500. Her W-2s at the end of the year equal $25,500. Angela's tax credit should have been $74/month. Now she may not get as much of a tax refund. Angela loses her job or her hours are cut in half. Angela is going to make $12,000 for the year. Angela should report her income change to the Marketplace and apply for Medicaid. It's important because, if you don't reconcile the tax credits for one year, you can't get tax credits for the next year. Imagine that you and a friend want to go to the Bruce Springsteen concert. Your friend says, "I'll get the tickets. I think they are selling for between $80 and $120." You say, "How about if I give you $100, and then when you actually find out the cost, we can settle up." Fast forward to the next week, and your friend tells you the tickets cost $120. What if you didn't ever pay your friend the extra $20? Your friend probably wouldn't want to advance money for tickets to the next concert. So, too, with the Affordable Care Act. If you got tax credits in 2014 or 2015, and you didn't reconcile those tax credits when you did your 2014 or 2015 taxes, you will not get tax credits for 2017. When you receive Advance Premium Tax Credits from the Marketplace, you are agreeing to file taxes for that year and file jointly if you are married at any time during the year. If you earned less than you estimated when you applied on the Marketplace (or if you had more dependents than you expected you would), you will probably be eligible for additional tax credits. This would be added to any tax refund you might get. If you made more than you estimated when you applied on the Marketplace (or if you had fewer dependents than you thought you would), you probably got too many tax credits, and will owe back money on your taxes. How Do I Reconcile APTCs? To reconcile your taxes, you need to have the correct forms and all your income information for the year. If you were married at any time during the year, you must file jointly with your spouse. What If I Didn't Reconcile Tax Credits For 2014 Or 2015? Can I Catch Up? You can amend your taxes and submit them to the IRS. Once you have submitted your amended taxes to the IRS, you can go back into your Marketplace application for 2017 and report a life change. This time, you will be able to answer YES to the question, "Have you reconciled tax credits for 2014 or 2015?" You will receive APTCs for the current year and be able to sign up for health care through the Marketplace. Health Care Olympics: Go For The Silver! The Olympics are going on! Olympic athletes will tell you that not only is it important to be in good shape and fine tune your athletic skills, it is also important to know the rules of engagement. For instance, in gymnastics, what will give you a small points deduction, and what will give you a large deduction? What if you have a false start in swimming or track? Jesse Owens won 4 gold medals at the 1936 Olympics. In the Olympics, Go for the Gold! The advice that you "go for the silver" might be surprising to you, considering that health care plans are ranked as Bronze (covers 60% of health care costs); Silver (70%); Gold (80%) and Platinum (90%). Surely gold and platinum plans, then, are better bets than silver or bronze plans? That might be true if you are a mere mortal, and not a true Olympian. Zeus and Hera, two of the original Olympians! If your income is below 250% of the poverty level, then you qualify for special cost-sharing, and the silver plans will cover more than their usual 70% of the cost of the health care. In this case, by choosing a silver plan you will get lower co-pays, deductibles, and maximum out of pocket costs. If your income is below 150% of the poverty level ($17,820 for a single person, $36,450 for a family of four), the silver plans will cover 94% of the costs, even better than a platinum plan! If your income is between 151% and 200% of the poverty level ($23,760 for a single person, $48,600 for a family of four), the silver plans will cover 87% of the costs, even better than a gold plan! Prepare, Predict, Go for it! Go for it: During Open Enrollment or a Special Enrollment period, fill out your application and choose the best health plan for yourself and your family! Open enrollment begins November 1, 2016 and ends January 31, 2017. How Does Your Income Affect the Cost of Your Marketplace Plan? Your monthly premium: the amount you have to pay each month to keep your plan active. Your deductible: the amount you have to pay by yourself for your health care before insurance will help cover your costs. Your out-of-pocket maximum: the highest amount you will pay all year. Once you pay this amount your insurance covers all the costs for the rest of the year. Thankfully there’s assistance to help pay for all three for those who need it! You might have heard of premium tax credits, but how does the government decide how much you have to pay and how much help you get? It all comes down to income. The Affordable Care Act has set guidelines for the maximum percentage of your income you’ll have to put towards your monthly premium. Those percentages are called premium caps. That cap is used to calculate the dollar amount you will have to pay and then you get a premium tax credit to cover the rest of the cost of your plan. The more you make, the higher your cap, and the less you make the lower your cap. So the lower your income the more you can get in premium tax credits. The table below shows the premium caps based on level of income. If you make less than 250% of the poverty level and choose a silver plan, then you can get extra help with your out-of-pocket expenses. This extra help is a cost-sharing subsidy. The subsidy works by lowering your out-of-pocket maximum and your deductible, and raising the percentage of costs covered by your insurance. Normally a silver plan covers 70% of the cost and you have to pay the other 30%. But with cost-sharing subsidies your insurance might cover 73%, 87%, or even 94% of your expenses – meaning you have to pay less out of pocket. The amount of help you get is based on your income and, again, the lower your income the more help you receive. Check out this example to see how premium tax credits and cost-sharing subsidies can work together to make your health care affordable! If your income does not qualify you for significant cost-sharing subsidies on the silver plans, you may find that a bronze, gold, or platinum plan is better for you. To get an idea of what assistance you might be eligible for, visit the Marketplace at www.healthcare.gov/see-plans. Under the Affordable Care Act, everyone needs to have insurance. When you file your taxes, you prove that you had insurance by submitting a form. If you were enrolled in health insurance during 2015, you will receive one or more copies of a 1095-A, B or C. (Read about those forms here.) Your 1095 forms will be mailed in early February. You can also find your 1095-A in your Marketplace account in your messages. These forms are filled out by the Marketplace, your employer, or Medicaid. Don't fill it out yourself--if you think the information is wrong, you can get a corrected form. If you take your tax information to a tax preparer, bring those forms with you. If you prepare your own tax forms, you will need those forms to file your taxes. If you had employer coverage or coverage through public insurance like Medicaid or Medicare, you simply provide those forms when you file your taxes. If you got health coverage through the Marketplace, it is a different story. If you received tax credits to help pay your health insurance premiums, then you paid part of your health insurance costs and the government paid part of your health insurance costs. At the end of the year you reconcile your tax credits when you file your taxes. You will need Form 8962 and your 1095-A. Remember when you enrolled in Marketplace insurance, you agreed to file taxes and reconcile the income reported on your application with your actual income on your tax return. As can be seen in the example above, you get Advance Premium Tax Credits (APTCs) when you do your application for health insurance on the Marketplace. At the end of the year, you take a look back. If you estimated correctly on your income, your Advance Premium Tax Credits turn into Premium Tax Credits, and you don't owe anything, but you also don't get anything back. If you estimated low (and end up making more money), you may owe back some of those tax credits. If you estimated your income high (and don't do as well financially), you may get some additional Premium Tax Credits. This reconciliation, as it is called, happens with the help of Form 8962. You only need to reconcile tax credits for the months where you had APTCs. If, for instance, you had employer coverage the first half of the year, and Marketplace coverage the second half of the year, you will indicate that on your taxes, but you will only reconcile your APTCs for the second half of the year. One more caveat--if you don't reconcile your tax credits, then you won't be able to get Advance Premium Tax Credits on the Marketplace next year.